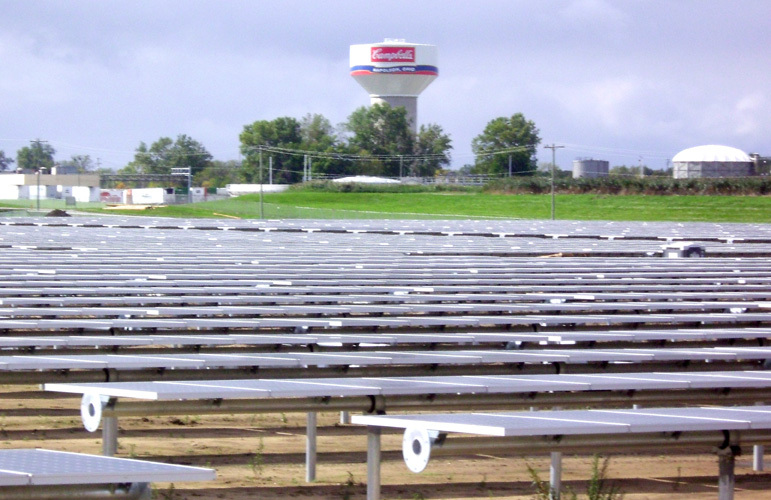 The Campbell Soup Company has taken a big spoonful of PV power, with the installation of a 9.8 MW solar power system at its Napoleon, Ohio, facility, said to be the largest food production plant in the world. Food manufacturing giant The Campbell Soup Co. had its humble beginnings in the late 1800s, when Joseph Campbell bought out his partner in the Anderson & Campbell Preserve Co. and expanded its offerings to include the eventual best-selling Beefsteak Tomato Soup. Since then, the Camden, New Jersey-based firm has grown to become world renowned for its soups as well as V8 beverages, Pepperidge Farm cookies and baked goods, SpaghettiOs, Prego Italian sauces, and Pace salsa, to name a few of its food products. The Campbell Soup Co. recently became known for another product—large-scale solar-generated electricity. When a 9.8 megawatt photovoltaic project came online at Campbell's Napoleon, Ohio, plant this past December, it marked the largest solar inside-the-fence project in the United States. The single-axis tracking system will supply about 15 percent of the plant's annual electricity needs. Spurred partly by shareholders and large customers such as Walmart and partly out of social responsibility, company leaders implemented a sustainability initiative about five years ago, says Bob Shober, the company's vice president of infrastructure, engineering, and environmental programs. As part of that initiative, leaders set lofty goals of reducing greenhouse gas emissions by 50 percent per unit of production by 2020. The sustainability initiative also means becoming more energy efficient and converting 40 percent of the company's electricity use to renewable sources, he says. 100 kW system in Paris, Texas; and a 2.3 MW system in the works for Sacramento, California, will supply about six percent of the company's electricity demand. "This is a start—a good start," Shober says. Campbell's Napoleon plant, located about 40 miles southwest of Toledo, is billed as the world's largest food processing plant with 55 acres under one roof. It produces mainly soup and juice products. 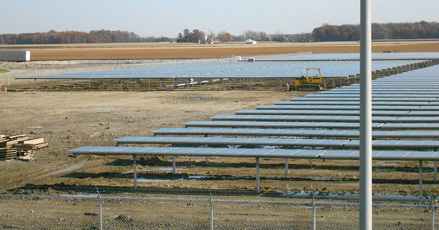 In 2008, company leaders began exploring ways to meet their sustainability goals through renewable energy. Among the options were developing a project themselves, buying so-called green electricity, or entering into a Power Purchase Agreement (PPA) with a renewable energy developer, Shober says. Developing the project themselves didn't meet specific company financial thresholds, he says. "We have completed many energy efficiency projects that provide the company an excellent return on our investment," Shober says. "While the Napoleon solar panel project has a solid financial return, it doesn't meet our internal hurdle rate for savings projects." If the Campbell Company went on the open market to purchase so-called green electricity, it wouldn't have been able to lock in a favorable rate for 20 years as it did with the eventual PPA. "We could go on the market and offset 40 percent of our electricity today by buying green power, but this didn't feel right," he says. "With the purchase of green electricity, you're paying an additional cost and have nothing to show other than a certificate that says you are buying green electricity. The PV system was built on land owned by the Campbell Company, but leased back to Enfinity BNB Napoleon Solar, the owner and operator of the system. Under the PPA, Campbell will buy 100 percent of the power for 20 years. "Here we have something that's very tangible. This is the largest solar panel project that is not associated with a utility in the United States." When Campbell's officials decided on a PPA, they sought a partner with experience in developing large alternative energy projects and securing the required financing. New York-based BNB Renewable Energy Holdings LLC and Atlanta-based Enfinity America Corp. acted as co-developers of the project. "They had a track record of several large, successful projects that helped us decide to go with them," Shober says of the BNB-Enfinity team. Initially, Campbell and BNB Renewable Energy looked at wind energy for the site adjacent to the plant. "The current system of 60 acres of solar panels would have been the equivalent of four wind turbines," Shober says. "Because it was going to take about two years to get through the permitting process for wind, we switched gears and went with the solar." At about the same time, the Ohio Senate passed Senate Bill 221, which helped expedite permitting for PV projects, says Matthew Baird, a principle and founder of BNB Renewable Energy Holdings. The 2008 legislation was designed to encourage development of alternative, renewable and energy efficiency activities in the state. Among the key provisions are an alternative energy portfolio standard, energy efficiency standards, solar-ready schools, and greenhouse gas emission reporting requirements. Baird says they went with San Jose, California-based SunPower to engineer and build the PV system because it has some of the highest output, lowest cost systems of any company on the market. SunPower's reputation also aids in financing projects that involve its panels, he says. "It's very important to work with a company that has warranties and has enough of a history," Baird says. The Napoleon project was one of the first installations of SunPower's new Oasis power plant in the United States, he says. It comprises the SunPower T0 Tracker and about 24,000 SunPower 425 Solar Panels. "What they've done is pre-engineered the system—a 'megawatt in a box,'" Baird says. "All of the wire runs, the racking systems, the inverter locations, everything has been pre-engineered so they're like building blocks. And they're manufactured in these units." This equates to a lower price for the same high performance while making field installation more efficient, he says. It also simplifies financing. "Once the financing entities know how one system performs, and if they know it can be comparable, it's very easy for them to get behind the next system," Baird says. "Uniquely engineered systems require a lot more field engineering review and involve more risk." Campbell officials will be reviewing the Ohio project to determine the next steps they need to take to attain the goal of converting 40 percent of their electrical use to renewable energy sources. In addition, the Oasis system features the TMAC, or Tracking Monitor and Control System, which uses global positioning system coordinates. Along with computer algorithms, it constantly adjusts the panels to the changes of the season. At the end of the day, as the sun moves lower on the horizon, panels in most tracking systems end at about 45 degrees and may cast deep shadows over adjacent ones, decreasing production. But the Oasis system backs down, which reduces some direct solar radiation. Nevertheless, it increases overall output because of reduced shading, he says. Although the Napoleon plant runs year-round 24/7, the period from September through February is peak time as it produces product for the winter "soup season," Shober says. Finding a time to shut down the plant for interconnections posed one hurdle. But a Labor Day weekend shut-down produced the fewest impacts. The Napoleon plant had just undergone renovation to the switch gear and had spare capacity on the busbar. So the plant had the capacity and distribution system to accommodate the 9 to 10 MW of additional power without major modifications, Baird says. Since the work was done correctly and on time during the Labor Day weekend, no additional plant shutdowns were needed, Shober says. Throughout the entire installation, he says SunPower worked closely with manufacturing management and plant engineering staff to coordinate traffic and deliveries. "We have hundreds of trucks coming in and out, ingredients coming in, and product leaving the facility," he says. "And there were logistics that we needed to work out. There were no problems associated from our side, and it went very smoothly." 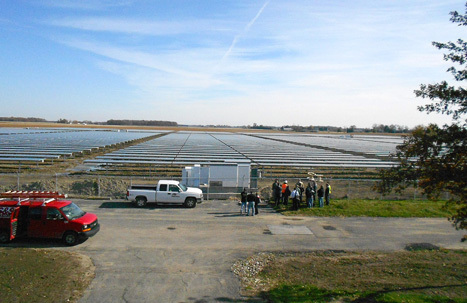 Vaughn Industries of Carey, Ohio, which last year completed the 12 MW PSEG Wyandot Solar Farm near Upper Sandusky Ohio, was the electrical contractor on the project. "I can't say enough great things about Vaughn," Baird says. "They are a hands-on, super well-organized group, and they have deep experience on substations and high-voltage electrical work." The installation went smoothly, except for record rainfall during November and into December. "That is a huge challenge for any construction site, much less one where you're doing so much work on the ground with foundation, installation, and electrical work," Baird says. "There were weeks where the electricians were working in high rubber boots in a foot of mud, and they were still able to deliver the project ahead of schedule and on budget." The PV system is owned and operated by Enfinity BNB Napoleon Solar. It was built on land owned by the Campbell Company but leased back to Enfinity BNB Napoleon Solar. Under the PPA, Campbell will buy 100 percent of the power for 20 years. The solar renewable energy credits (SRECs) will be sold to FirstEnergy Solutions of Akron, Ohio. During the 20-year PPA, the PV system is expected to save Campbell $4 million in electricity costs. In addition, it is projected to reduce carbon dioxide emissions by 250,000 million metric tons. Campbell officials will review the Napoleon and Sacramento projects to determine the next steps they need to take to attain the goal of converting 40 percent of their electrical use to renewable energy sources, Shober says. This process will evaluate all forms of renewable energy to support the remaining Campbell Soup and Pepperidge farm facilities located throughout North America. Baird says projects, such as the Napoleon plant where all of the energy generated is consumed on site, are the wave of the future. "I think the exciting thing here is you have a Fortune 500 company with a corporate social responsibility statement that is hosting and generating renewable energy on site," Baird says. "I think you're going to see more of these projects."